Remove two trim screws from below trip lip under two center vents near airbag off light. Carefully pop trim piece off. There are six or eight retaining clips which should fairly easily release if you start from the lip where the two screws were removed. Unplug airbag off light. These are pretty easy to remove. Under the stereo are 2 screws that hold the plastic dash piece that goes around the stereo. Once removed, then the dash portion will just snap off. Then you will see the 4 screws that hold the stereo brackets in. It doesn’t even just snap off after you remove silver 5/16” bolts – one from each side. You need to pry & push it out from the rear of the radio in order to not smash up the edge of the dash around the trim piece. The glove box and the compartment below the radio have to come out in order to see & get to the side silver screws. When it comes forward, you can disconnect the AC controls (2 plugs) so it will all come out and you can remove the radio from this assembly by taking out the 2 bolts on each side that hold it in the bracket. The cloth that comes up on the shifter will unsnap off the shifter handle. Squeeze it at the bottom edge of the shifter handle and it will pull down and off the shifter handle. Then the piece that holds the shifter cloth will need to come up and off, start by removing the plastic push pins towards the front on each side and there are 4 screws that hold it down (2 on each side and 2 on front edge under drawer that pulls open. Looking under there, there is 4 more screws that hold the drawer in from under it. Also by the key, that unsnaps there and there a screw at the bottom of the panel – left side of the stereo. The glove box has to come down, it’s catches inside on edge will pop out and allow this. Then with that whole assembly loosened, it will come out of the way, you have to unplug the 2 connectors in there. Then the 2 silver bolts on sides of stereo. And push out the stereo from below and behind. 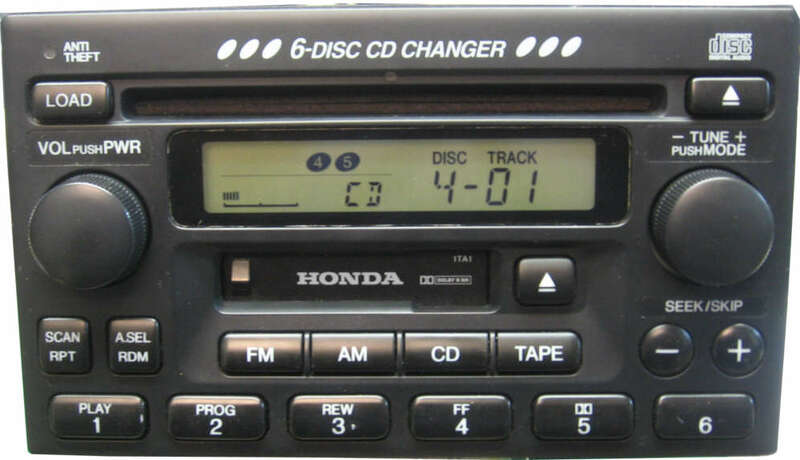 Comments: Thanks so much for doing such a great job on the repair of the CD portion of my in dash 2003 Honda CRV 6 Changer and for packing up the CDs that were stuck in it so nicely. "1997","Jaguar","XL6L","4 Door","Factory Stereo ","The factory stereo has static noise occasionally in the rear speakers. Volume control has no effect on this noise when present. Do you work on these units? If so, please provide an estimate. By the way, you guys fixed a Bose in another vehicle for me some years back and it worked great ever since! Thanks. Many times we don't get much feedback after a customer receives their repaired unit back and they are happy. Another thing that happens when a person is deciding whether to repair or replace the unit is a person will ask us "How long after the repair before I have problems again? or How long will the repair last? That is a hard question for us to answer. I can be sure that it works after the repair but I don't know for how long. Hopefully for a very long time and we will warranty it for 1 year, and even be helpful to you after that. Everybody's had that "too good to be true" notion about offers, deals and "come-ons," especially on the internet. Well...Willman's is most assuredly NOT too good to be true; they are true and they are good. I was impressed from start to finish when I entrusted my 10-year-old factory-installed automobile CD Changer to their care to diagnose and remedy, following 3 years of non-use because I couldn't find anyone to repair it within reasonable cost, and with such ease and dispatch. I found the answer in Willman's. I e-mailed and spoke personally to Daryl Willman on several occasions, who made himself available for consultation and step-by-step progress. The fixed-price estimate is rarely seen these days, and pre-approval for over-runs provides customer control at every stage. I will not hesitate to recommend Willman's to anyone requiring expert analysis and service. You were right that there was nothing wrong with the unit, the problem was a 15 amp fuse in slot 22 of the fuse box next to the steering column. I know I checked all the fuses once before, but somehow missed that one. Again your great service is appreciated. Problem: All 4 amplifiers, which are attached to each speaker were bad. The dealerships prices for 4 new ones was over $700.00. Willman's repaired mine and the total repair and shipping time was less than 2 weeks. Removal Tips: The web site instructions for removal and replacement are right on. I got them back today at 5PM and at 7PM they were reinstalled and sounding great. Comments: All the reasons for repairing, as listed at this site, are right on target for me. I don't want an after market system; after all I paid a premium to get this one when I bought the car! Comments: Hi: I read the instructions for replacing the Honda power antenna. Very helpful. In my case, it was easy since I only had to turn the radio on and off to feed in the new antenna. Thanks for the tip! 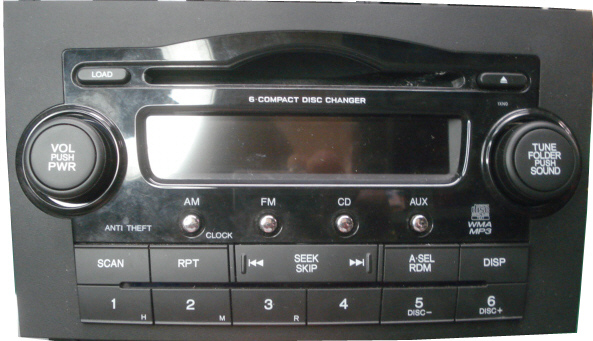 Check the info for your car stereo to know what needs to be repaired.